John Hay, Lincoln's private secretary and later secretary of state under presidents McKinley and Roosevelt, and Samuel Langhorne Clemens, famous as "Mark Twain," grew up fifty miles apart on the banks of the Mississippi River in the same rural antebellum stew of race, class, and want. This shared history drew them together in the late 1860s, and their mutual admiration never waned in spite of sharp differences. In The Statesman and the Storyteller, the last decade of their lives play out against the tumultuous events of the day, as the United States government begins to aggressively pursue a policy of imperialism, overthrowing the duly elected queen of Hawaii; violently wresting Cuba, Puerto Rico, and the Philippines away from Spain; and finally supporting a revolution to clear a path for the building of the U.S.-controlled Panama Canal. 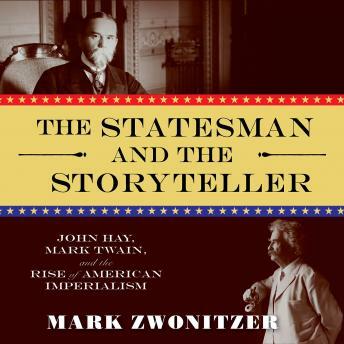 Stunning in its relevance, The Statesman and the Storyteller explores the tactics of America's earliest global policies and their influence on U.S. actions for years to follow. Ultimately, it is the very human rendering of Clemens and Hay that distinguishes Zwonitzer's work, providing profound insights into the lives of two men who helped define their era.